This beautiful Bobcat is prowling for ducks along the banks of the Madison River near the Madison Campgrounds. 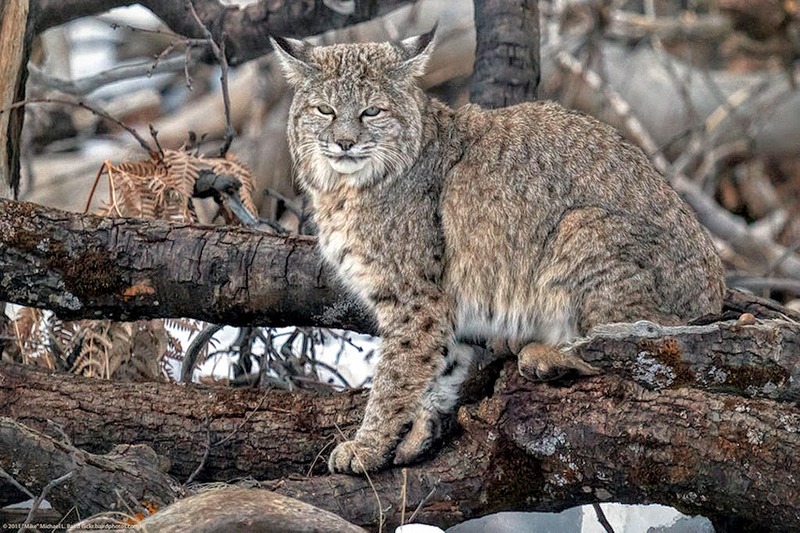 The Yellowstone Bobcat (Lynx rufus) is one of the more elusive animals to spot in the park. They like to hang out in rocky areas, conifer forests and you can occasionally see one near a river or lake as they hunt. Winter is a great time to spot one. The adults can reach 15 to 30 pounds or so and are usually 31 to 34 inches long. They are striking animals with their colors of red-brown fur with indistinct markings to light buff with dark spots, a short tail and ear tufts.. They are solitary and are most active between sunset and sunrise. They eat rabbits, hares, voles, mice, red squirrels, wrens, sparrows, grouse and sometimes deer and adult pronghorn. In the early years of the 20th century, bobcats were reported as "somewhat common" in the park. There have been 9 to 14 reported sightings each decade since 1960. These sightings have occurred throughout the park; about 80 percent have occurred in the northern half. Bobcats have been reported in about equal numbers during all seasons. In 1960, a bobcat was killed by a car near Squaw Lake (now Indian Pond) on the north shore of Yellowstone Lake; its skull was deposited in the Yellowstone Museum collection. Other roadkilled bobcats were reported in 1993 and 1996. In 1960, a young bobcat was reported on the porch of the administration building at Mammoth; other young bobcats have been reported at Pebble Creek bridge (February 1977) and at Canyon campground (July 1986), where one accompanied an adult bobcat. Unlike Canadian lynx, which they resemble, bobcats elsewhere have been highly adaptable to human-caused changes in environmental conditions; some biologists believe that there are more bobcats in the United States today than in colonial times. Yellowstone has many rock outcrops, canyons bordered by rock ledges, conifer forests, and semi-open areas that seem to offer conditions favorable for bobcats—adequate shelter, a variety of rodents, rabbits, hares, birds, and other small animals as well as seasonal carrion, for food. Carrion is seldom used if live prey is available. Studies elsewhere have shown that bobcats also may kill both young and adult antelope and deer; they stalk bedded adults and may be carried long distances while biting their prey in the neck. Bobcats live an average lifespan of about 7 years. Visitors are advised to report any sightings of bobcats or bobcat tracks to a ranger or visitor center. For animals so seldom recorded, every observation is considered useful and important.